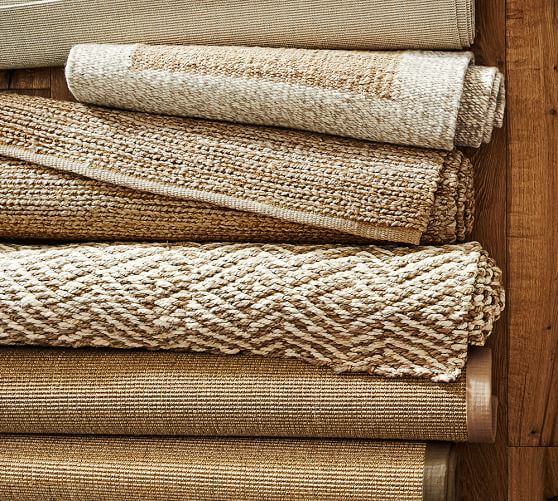 There is a reason Jute and sisal rugs are a designer’s best friend. 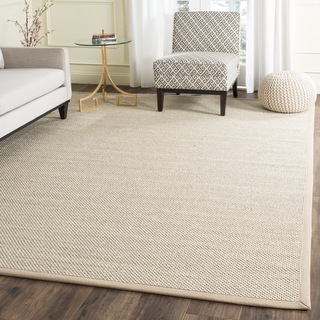 They look good with any dècor, deliver an updated look and our custom sisal rugs are highly durable. We also offer a huge selection with dozens of unique colors and patterns. Despite the yarn durability sisal is known for, slight matting of sisal carpeting may occur in high-traffic areas. Sisal carpet does not build up static nor does it trap dust, so vacuuming is the only maintenance required. High-spill areas should be treated with a fiber sealer and for spot removal, a dry cleaning powder is recommended. Jute and sisal rugs have a very rich cultural history. An Egyptian sisal rug is the one with the longest history and goes back all the way to the start of civilization. Sisal is a very durable and soft material whose fibers are spun into a thick and supple yarn that is woven into complex patterns used to create area rugs and broadloom. Sisal’s natural attributes make it fire retardant, sound absorbing and anti-static. Sisal is much stronger than most other natural fibers that are found in rugs, such as flax, jute, and hemp. Jute rugs are a long, soft, shiny vegetable fibre that can be spun into coarse, strong threads. It is produced primarily from plants in the genus Corchorus, which was once classified with the family Tiliaceae, more recently with Malvaceae, and has now been reclassified as belonging to the family Sparrmanniaceae. The primary source of the fibre is Corchorus olitorius, but it is considered inferior to Corchorus capsularis. “Jute” is the name of the plant or fiber that is used to make burlap, Hessian or gunny cloth. Jute, also called hessian or burlap, is a natural fiber found in clothing, luggage, and home furnishings. Jute carpets have some of the softest fibers in the world and feature a gold shine in their natural state. Jute may also be dyed a myriad of colors to provide different shapes and patterns in colorful carpets. Some manufacturers may mix jute fibers with synthetic fibers to create a stronger, more durable carpet. However, jute rugs can become discolored, stained, or mildewed and you may need to know how to clean a jute rug with proper care. Vacuum a jute rug twice a week to prevent dirt accumulating in the jute fibers. Vacuum both sides of the rug as well as the floor underneath. Use a dry-cleaning powder to clean a jute carpet. Sprinkle the dry-cleaning powder onto the carpet, and use a stiff bristle brush to clean the jute fibers. Shake out the rug or vacuum as needed. A dry-cleaning kit may be available at carpet stores or online that contains the dry-cleaning powder, a spot remover, and a brush. Scrape solid spills with a dull knife, and then brush with a stiff bristle brush. Follow by vacuuming. Clean liquid spills on a jute rug by blotting. Avoid rubbing the spill. Club soda may be used to neutralize acidic spills such as red wine or tomato sauce. Dry any wet spills immediately with a hair dryer or fan. Remove mildew from a jute rug. Mix 1 part bleach to 6 parts water in a spray bottle. Test the mixture in an unseen spot on the rug. If discoloration occurs, dilute the spray and retest. Once the mixture is satisfactory, spray a little on the mildew, and work in with a soft brush. Rub with a dry cloth after 10 minutes. Treat jute rugs with a jute sealer. This can minimize the jute fibers’ absorbency and protect the rug from stains. This will allow you a little more time to get any spills cleaned up before they set into the rug.